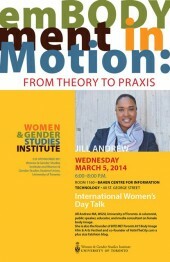 Jill Andrew MA, WGSI, University of Toronto. A columnist, public speaker, educator, and media consultant on female body image. She is also the founder of BITE ME! Toronto Int’l Body Image Film & Arts Festival and co-founder of FatinTheCity.com a plus size fatshion blog. The talk will take place in Room 1160, Bahen Centre for Information Technology, 40 St. George Street from 6:00 – 8:00pm. Co-sponsored by: Women & Gender Studies Institute and Women & Gender Studies Student Union.